The Russian Foreign Ministry has criticized western leaders after none appeared to condemn the shelling of a mobile Russian hospital by militants in Syria. Two Russian medics were killed after around a dozen of shells hit the facility in Aleppo. 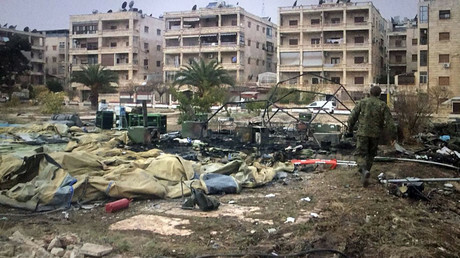 “On December 5, a Russian military medic died as a mortar shell fired by militants directly hit the reception ward of a Russian mobile military hospital set up in Aleppo. Two medical specialists were also severely injured and one of them later died,” the ministry said. “However, no words of condemnation can be heard from western capitals,” it added, criticizing western governments for their “politicized approach” to the assessment of the situation in Syria. “We call on our partners to abandon the politicized approach and finally join the counter-terrorist efforts in Syria as well as the search for a political solution to the Syrian crisis” instead of waging a smear campaign in the media, the ministry said in its statement. It then went on to criticize Paris and London, saying they are waging a “propaganda campaign” – in particular over the delivery of humanitarian aid. “Our ‘concerned’ French and British colleagues cannot but know that such aid is already rendered to the Aleppo residents … by the Russian side through the Russian Reconciliation Center in Syria and the Russian Emergencies Ministry,” the foreign ministry said. 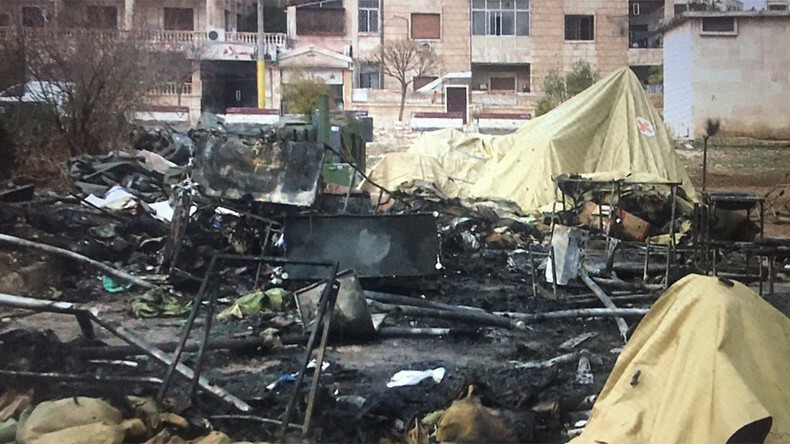 About 11 shells landed on the territory of the Russian hospital leading to its total destruction, Vladimir Savchenko, the head of the Russian Reconciliation Center in Syria told journalists earlier on Monday. The Russian Defense Ministry urged for the international community to condemn the attack and said that the incident would be investigated and all responsible would be held to account. “It is beyond doubt that the shelling was conducted by the ‘opposition’ militants. Moscow understands who gave the Syrian militants the coordinates of the Russian hospital right at the moment when it started working,” the Defense Ministry’s spokesman, Major General Igor Konashenkov said. The US State Department, which is usually quick to comment on reports of attacks on medical facilities in Syria, found it difficult to confirm and therefore specifically condemn the shelling of the Russian hospital. RT has requested comment on the shelling of the Russian hospital from the office of the UN High Commissioner for Human Rights, as well as the Red Cross, Human Rights Watch, Human Rights First, and Amnesty International. “But usually if we have not documented and been able to verify details for ourselves it can be tricky for us to provide a comment on specific attacks,” the emailed response reads. 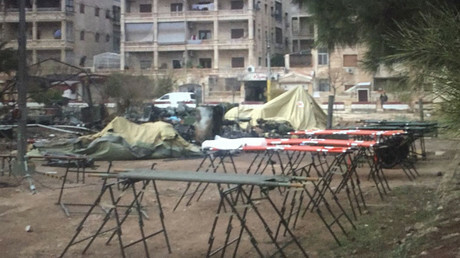 “Repeated attacks on healthcare and other civilian infrastructure throughout Aleppo” indicated that “all sides to the conflict in Syria are failing in their duties to respect and protect healthcare workers, patients and hospitals, and to distinguish between them and military objectives,” the Red Cross told RT in a comment following the shelling of the hospital.